On September 17, 2017, the Kościuszko Park in Milwaukee was again a place of gathering for Poles expressing their admiration for the Polish-American hero, Tadeusz Kościuszko. The event was organized to honor the 200th Anniversary of his death – commemorated worldwide under the patronage of UNESCO – and to celebrate the Year of Kościuszko as declared by the Senate of the Republic of Poland. An important message reverberating throughout the Sunday’s event was the need to teach our children the history of their ancestral homeland and its heroes. The task is already a part of the teaching program in the St. John Paul II Polish Saturday School (KPSS), one of the event’s organizers. 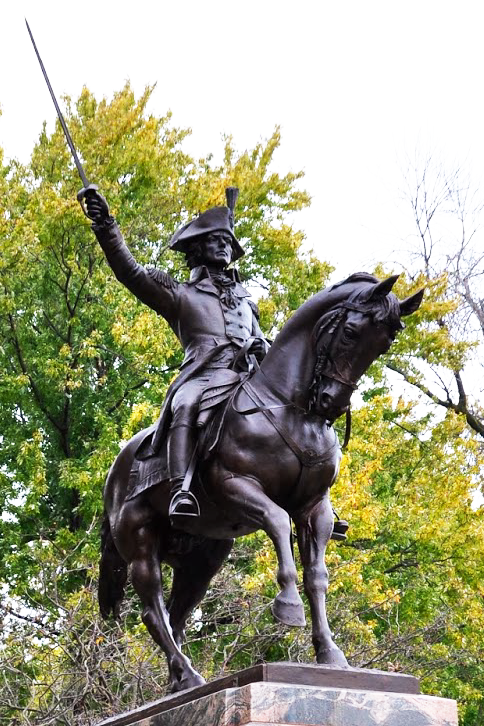 But the “Day with General Kościuszko” was embraced as a great venue for the children of Milwaukee’s Polonia to learn more about the hero recognized in both the country of their ancestors and the country where they live. The event began with a mass celebrated by Father Edward Traczyk in the beautiful church of Polish SS. Cyril and Methodius. Erected by Milwaukee’s Polish residents and dating back to 1892, the church still makes all services available in Polish language. It also hosts the St. John Paul II Polish Saturday School (KPSS), whose accomplishments have won it the Clement Zablocki Civic Achievement Award granted in 2016 by the Polish American Congress – WI Division. The ceremony in the Kościuszko Park commenced after a spirited procession arrived from the SS. Cyril and Methodius church waving the Polish and American flags and carrying the wrath to be placed at the Kościuszko Monument. David Rydzewski (president of the Polish American Congress – WI Division) and Bożena Przybysz (KPSS coordinator) delivered the opening remarks. Fr. Edward Traczyk spoke next reinforcing his earlier message of the importance of teaching history to the children and reminiscing about the estimated 60,000 people attending the first dedication of Kościuszko Monument in 1905 (second dedication took place in 1951 when the statue was moved across the park to its current location). The monument’s history moved front and center again in the words of Claude Krawczyk, a chair of the Kościuszko Monument Restoration Committee, attending the event with two other committee members: Judy Ramazzini and Susan Mikos. It is thanks to the committee and hundreds of benefactors that after renovation and rededication on the Independence Day in 2013, the monument now adorns the park in its unvarnished glory. The wrath honoring the “Hero of both Hemispheres” was laid at the monument’s base after the participants sang the American and Polish anthems. Katarzyna Zawiślak (KPSS) led the singing and later directed also her young students playing a traditional tune Płynie Wisła, płynie, po polskiej krainie (Flows the Vistula River, flows across the Polish lands)) on hand bells. The choice of song could not be more opportune since along with Tadeusz Kościuszko, the Vistula River is one of several honorees proclaimed as 2017 patrons by the Polish Parliament. Besides the animated group of school children wearing the folk costumes or red T-shirts (with the school logo and coat of arms of the Republic of Poland in the back), four characters in Kościuszko outfits gave the event a very special flavor. 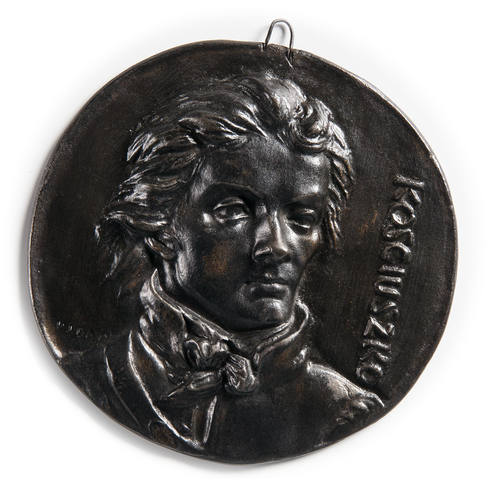 Stealing the rest of the show, the “Four Kościuszkos” delivered speeches recounting in Kościuszko’s voice the three main phases of his life. Brothers Fabian and Kevin Marchewka (both from the Catholic Polish Saturday School of St. John Paul II) gave voice to the young Kościuszko describing his childhood, school years and favorite subjects. 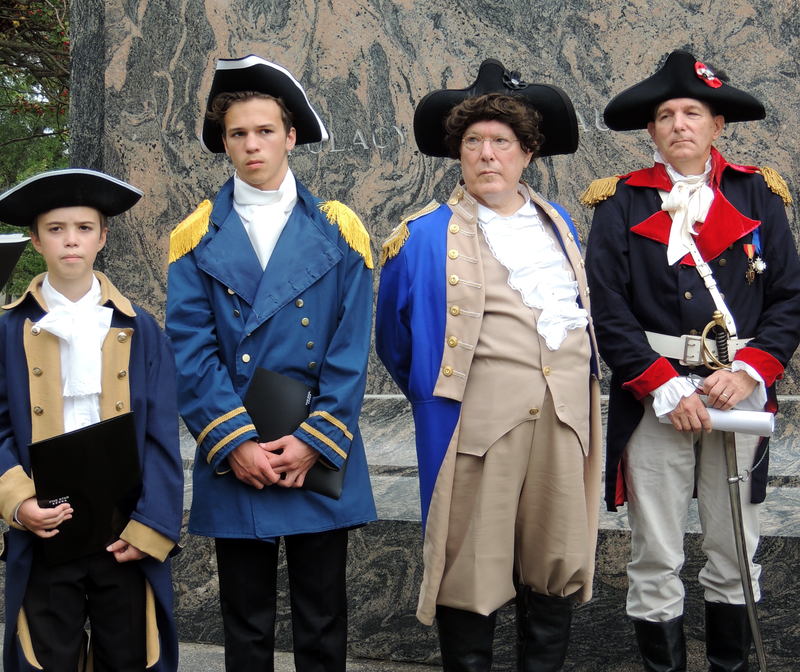 Stan Graiewski’s (Polish American Congress – WI Division) speech focused on the Kościuszko’s engagements in the American Revolutionary War and ended with a salute to the attentive audience. “There are many, many memorials and monuments to what I stood for – freedom, independence and social justice – for all people. Like the beautiful monument right here in Milwaukee. But perhaps the two best testimonials are the living ones. One is the America’s Civil Rights Act of 1964. The other is the Poland of today – a democratic, free and independent Poland, a Poland for all Poles whatever their station in life, a Poland that is a trusted friend and ally of the United States. The event will begin following the procession from St. Maximillian Kolbe Church to the Kościuszko Monument starting after the end of 10:30 am Mass in Polish. Anticipated time of the event in Kościuszko Park is 1 hour. The free lecture with refreshments will be hosted in the Polish Center of Wisconsin. The event is sponsored by the Milwaukee Society of the Polish National Alliance and supported by Polanki (the Polish Women’s Cultural Club of Milwaukee), the Wisconsin State Division of the Polish American Congress, the UW-Milwaukee Polish Studies Committee and the Polish Heritage Alliance.